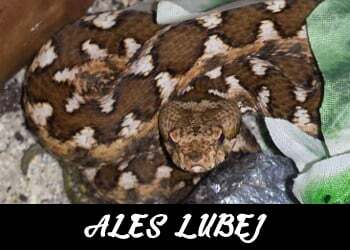 Vipera ammodytes is a venomous viper species. There are three recognized subspecies of Vipera ammodytes (V.a.ammodytes pictured). The most distinctive characteristic is a single “horn” on the snout, just above the rostral scale. Vipera ammodytes have a zigzag dorsal stripe set against a lighter background. This pattern is often fragmented. A terrarium or plastic box of 0.8 x 0.4 x 0.3 meters (2.6 x 1.3 x 1 feet) is an adequate enclosure for an adult pair. Vipera ammodytes are mostly active during breeding season. Males during breeding season are territorial so if you house 1.1 you won’t have any issue but if you house 2.1 as a group you might face different behavior with males. They will combat for the female. Fights are not a problem since they don’t bite each other they just try to overpower their competition. Vipera ammodytes are not problematic snakes and they don’t get easily stressed. This doesn’t mean that they don’t need a place to hide, where they will feel safe. It can be hide box, a pile of branches or stones. Vipera ammodytes live in dry places, so my substrate recommendations would be a good dry soil, a mix of sand and soil, bark and wood chips. Vipera ammodytes is an easily adjusted species. They live in areas where temps vary from 20 °C (68 °F) to 32 °C (90 °F). I keep my specimens (V. a. ammodytes and V. a. meridionalis) at the range of 23-28 °C (73-82 °F). For breeding purposes, they hibernate with a temperature drop at 2-12 °C (35-55 °F). I hibernate my specimens from end of December to middle of March at 5 °C (40 °F). I give them throughout the year 12/12 hours light cycle. But we can regulate the cycle according to the time of the year as : Spring 12/12h, Summer 14/10h, Autumn-Winter 11/13h. Always keep clean water in a large container but not too tall. It’s a good practice to change the water every 2-3 days or whenever the snake defecates in the water bowl. This species drinks from their water dish. Viper ammodytes live in dry environments, so they don’t need high humidity levels. I keep my specimens on room humidity around 50-60% and sometimes up to 70%. Vipera ammodytes are not problematic feeders. They eat rodents, small birds and small reptiles. In captivity they eat mice and small rats. Neonates can refuse food in rare occasions. I feed my neonate and sub-adult specimens with fuzzy mice every two weeks and my adult animals with adult mice once a month. They are territorial and pretty aggressive in and out of the terrarium. Handling snakes as little as possible is always a good standard. I handle my specimens only when needed; cage cleaning, medical issues etc. Good hooks and set of clear tubes are essential when keeping venomous species. I spot clean when feces are present. A full change of the substrate and disinfecting of the enclosure is taking place every 2 to 3 months. During the full clean up the snakes are moved to temporary enclosures. They shed pretty rarely in comparison with other snakes; young animals shed once every two months, adult animals shed 1-2 times on year. They shed without problems in one piece. If you see that you have issues with shedding most probably your humidity levels are low. 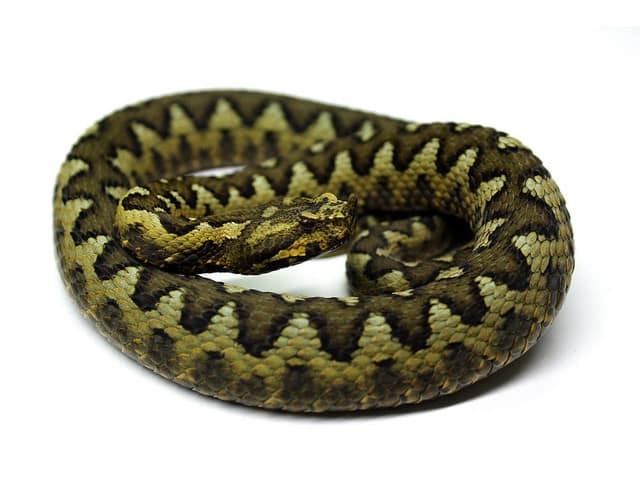 No specific potential health problems to mention for this species beyond those affecting reptiles and/or snakes in general. Only typical problems of reptiles in captivity; lung infection if the temperature drops too fast from warm to cold, scale rot if they live in high humidity levels with not enough circulation of fresh air.